Matchstick quilting is a term used to describe straight line quilting placed very close together, about 1/8″ or a matchstick’s width apart. This method can add an interesting texture to any quilt project when used with different colored threads, or in unquilted areas which will appear puffier or more pronounced than areas with matchstick quilting. My favorite foot for creating matchstick quilting is the Patchwork foot #97D with the Dual Feed feature on my B 770 QE. 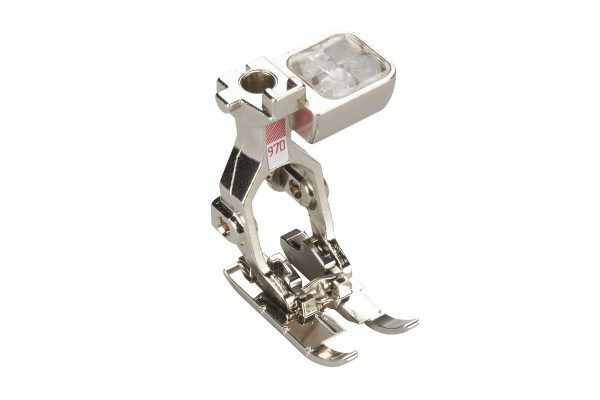 This foot is specially designed for accurate feeding and stitching, with a narrow groove under the flat sole serving as a thread channel for smooth piecing and quilting. 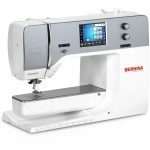 The small needle opening helps prevent fabric from being pulled down into the feed dog when sewing narrow seams, and helps create perfect stitches when quilting. This foot features evenly spaced marks along the edge and on the front of the foot to help evenly space your stitches. Watch the quick video tip below to see how to use these marks to create perfectly spaced 1/8″ matchstick quilting, and keep reading below for more matchstick quilting tips! The project in the video tip is an orphan block mini-quilt I made out of an old quilt block I found at a second hand store. If you’d like to see how I repurposed the block into a mini-quilt, check out my Orphan Block Mini-Quilt here! For a very small project (like the mini-quilt above), I start in the middle of the piece with one straight line of quilting, then alternate out from the center on each side with 1/8″ lines using the marks on my Patchwork foot #97D as a guide. For larger quilt projects I start by creating straight lines every 2″ across the entire surface of the quilt (either by marking the lines directly on the quilt top or creating the lines with blue painter’s tape). Then I start in the middle, and fill in each of the spaces with 1/8″ lines using the marks on my Patchwork foot #97D as a guide. As an alternate version, I have used the method of quilting between to create the matchstick quilting (you can use the Patchwork foot #97D or the Walking foot #50 for this technique). In this method, start with straight lines quilted at 2″ intervals as above. 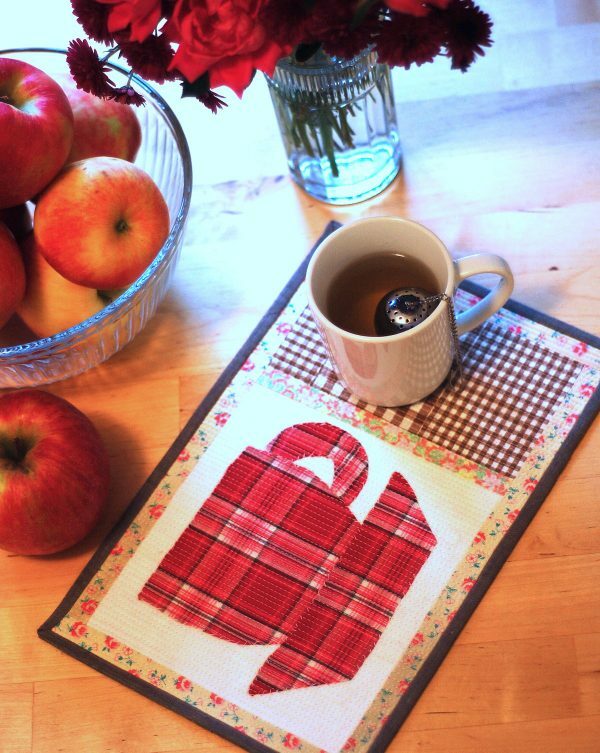 Next, stitch a straight line between every 2″ line to create quilting spaced at 1″ intervals. Then stitch a straight line between every 1″ line to create quilting spaced at 1/2″ intervals. 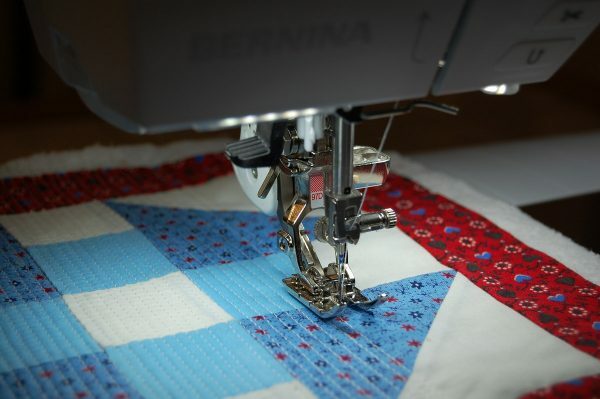 Keep going until you have created straight line quilting at 1/8″ intervals. Press your seams as flat as possible for matchstick quilting! With stitching so close together, any bulky seams may cause you some issues with your foot getting “stuck” trying to sew over seams. This can result in crooked or skipped stitches. Baste well with your favorite method! If you are using temporary spray adhesive, make sure that you have sprayed your layers evenly and have smoothed out all bubbles or bumps. If you are pinning, make sure that you have smoothed out the layers nice and flat, and that you use plenty of pins. Take breaks as often as you need to—don’t get too hurried! This method of quilting close together can cause eye fatigue, so if you feel like you’re getting a little tired, take a tea break and come back to the quilting later. I promise, your quilt will be there waiting for you. Have you tried matchstick quilting before? Do you have any great tips that I may have missed? Let me know in the comments below! 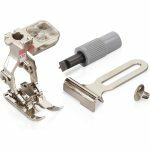 Does this foot fit on a 430 QE ?